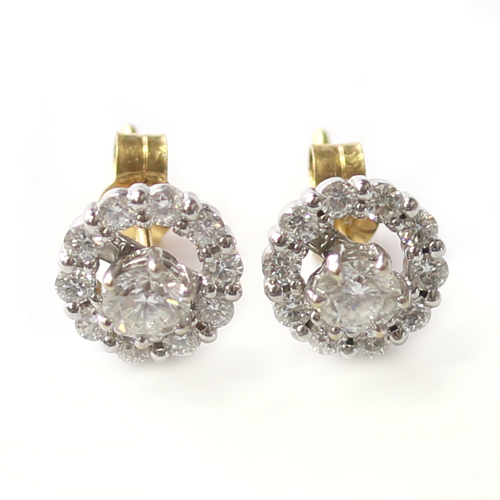 White Gold Interchangeable Diamond Halo Earrings — Form Bespoke Jewellers Ltd.
A beautiful pair of innovative and interchangeable diamond halo earrings. The customer came to us with an ingenious idea for a pair of bespoke earrings. They were looking to have created a halo design which would allow the centre section to be removable. This way, any stud earring could be interchanged into the halo to allow a whole new look. Alongside the guidance of our expert jewellers, their design was brought to life through our CAD software. The dual metal casting was returned to us and then hand set in our Chapel Allerton workshop. Each halo showcases ten round brilliant cut diamonds, held in place with complimenting white gold claws. The removable studs hold another white diamond but with yellow gold backs. We love that the customer can interchange their other earrings into these bespoke halo earrings. What a special design!